Via DelawareOnline: “The first step to reducing violence among young people is to have police officers assigned to elementary and middle schools, says a coalition of state officials, education administrators and police.” Ugh. No. I guess we have our “presumptive nominees” now from the two major political parties. And now, onward, with 5 more months of presidential campaigning. Ugh. “Here Is The Powerful Letter The Stanford Victim Read Aloud To Her Attacker.” Note the page views: over 15 million. “Worcester Polytechnic Institute is being sued by a student who was raped by a security guard at a building where she and other WPI students lived in Puerto Rico while on a research program,” Inside Higher Ed reports. WPI blames the victim. Here’s the EdWeek headline: “Company Exec. for Ed-Tech Company Testifies in Ala. Politician’s Trial.” The details: “Michael Humphrey, executive vice president at Edgenuity, testified in the ethics trial of state House Speaker Mike Hubbard, who is accused in a 23-count indictment of using his clout to attract business for companies he leads. Humphrey testified that he hired Hubbard on a $7,500-per-month consulting contract to connect him to legislative leaders in other states, as Edgenuity tried to sell digital courses.” Gee, good thing no one else in ed-tech is in the business of selling these sorts of connections between companies and politicians and schools! More on lawsuits in the sports section below and the poop emoji section above. “This is the most racist math test you’ll ever see,” says Vox. “Ohio State Accuses 85 Students of Cheating on Online Tests,” The Chronicle of Higher Education reports. Via The Texas Tribune: “A high-performing West Austin school district says it was told the state’s new testing vendor misplaced some or all of the STAAR exams its 3rd through 8th graders took this spring. But New Jersey-based Educational Testing Service says that’s not true.” ETS says it hasn’t lost the tests. It just doesn’t have them yet. ETS says it will discourage graduate departments from relying too much on GRE scores. According to EdSource, parents in California will receive “easier-to-read” reports on their children’s Smarter Balanced test scores. “Columbia Drops SAT Subject Tests Requirement,” Inside Higher Ed reports. “Should Your Online Course Sound Like ‘Serial’?” asks Edsurge. I’m not sure what this means as the article talks about both “authenticity” (whatever that is) and the gender of instructors on various MOOC platforms. 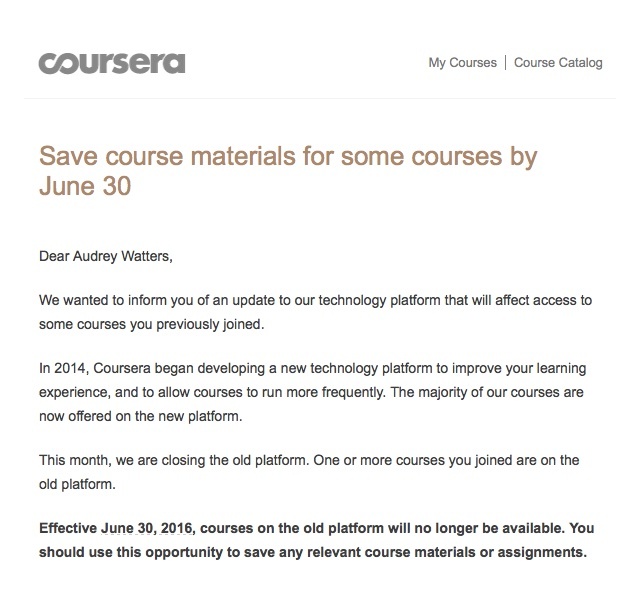 Good thing I never did anything in those MOOCs, otherwise I'd be losing my work. Via The Chronicle of Higher Education: “The Association of Private Sector Colleges and Universities, a group representing for-profit colleges and universities, is once again changing its name, it announced on Monday. Now the group will be called Career Education Colleges and Universities, to reflect its focus on career training.” Here’s the organization’s press release, announcing the rebranding. Another for-profit chain on the brink? “Education Department Orders ITT Educational to Bolster Finances,” The Wall Street Journal reports. Via the IndyStar: “The Carmel company that runs the ITT Technical Institute chain of for-profit colleges has yet to decide how it will respond to a new federal requirement that it set aside extra money to protect students in case it collapses.” “Could intense federal scrutiny lead to ITT’s collapse?” asks Education Dive. More on for-profits in the accreditation section below. Dowling College is closing. No. Wait. “Dowling College to Remain Open for Now,” says The Chronicle of Higher Education. Contrasting community college takes: a Pearson op-ed in Edsurge versus pretty much anything “Dean Dad” writes. Senator Elizabeth Warren says that the Accrediting Council for Independent Colleges and Schools has a “long record of failure” and urges that the “glaring lack of oversight” that the accrediting body has had for for-profit universities warrants federal scrutiny. The Center for American Progress also slammed the ACICS in a report issued this week. Via Buzzfeed: “Watchdog Let $6 Billion In Federal Funds Go To Colleges Under Government Investigation.” ACICS is clearly a terrible watchdog. “Accreditor of For-profit Colleges Agrees It Needs a Makeover,” says ProPublica. ACICS is freezing new membership, which is a start, I guess? Via Inside Higher Ed: “A new study, published in the Academy of Management Journal, suggests that when ‘high-reputation’ institutions – colleges and universities ranked among the top 50 institutions by U.S. News & World Report – run afoul of National Collegiate Athletic Association rules, they actually see an initial increase in support from alumni. But that surge in alumni support declines as a program racks up more violations, and nonalumni are less likely to donate after even a single infraction.” Go team. Adjuncts at McDaniel College have voted to unionize. In other Microsoft/Minecraft news, the company will donate $10,000 to the Marietta Center for Advanced Academics to build a Minecraft Lab at a local school. That doesn’t seem like much money if you’re selling access to your students as a “case study” for a tech company. But hey. Minecraft. Chicago-based startup The Graide Network lets teachers outsource grading via a marketplace for “on demand teaching assistants.” Sounds totally legit and not at all like a FERPA or HR violation. Details on the startup via ChicagoInno. “Tinder discontinues service for users under 18,” Techcrunch reports. Via the BBC: “Tutoring is one the world’s oldest professions, but even a vocation so entrenched cannot escape the rising ‘Uberisation’ of daily life.” Blech. "Gates Foundation failures show philanthropists shouldn’t be setting America’s public school agenda," says The LA Times, which has been pretty happy to go along with that agenda. Dan Meyer writes “Why Secondary Teachers Don’t Want a GitHub for Lesson Plans,” in a response to Chris Lusto who suggests that we do (or at least “We need GitHub for math curriculum.”) Lots of comments on these posts about lesson sharing sites, about the value of creating one’s own course materials, and about what GitHub can and cannot do. “A psychology instructor at Kwantlen Polytechnic University says he was forced to choose between his principles and the wishes of his publisher as part of a disagreement about the textbook industry and the role of open educational resources,” Inside Higher Ed reports in a story of how Rajiv S. Jhangiani withdrew a chapter from the anthology Thematic Approaches for Teaching Introductory Psychology. “Lifeliqe debuts VR-enabled educational content to keep kids interested in learning,” says Techcrunch. “Debut” is really not the right verb as it’s not actually released a product yet. Oh VR promises. Never change. “Manufacturing’s return creates greater need from higher ed” is some A+ spin from Education Dive and The Wall Street Journal. ABA English has raised $13.7 million for English-language instruction videos. The Crunchbase description makes it sound a little more exciting, I guess: the startup has “a unique teaching methodology and uses its own proprietary technology.” It has raised $15.36 million total. ApprenNet has raised $4 million in Series A funding from City Light Capital, Social Capital, 1776, and Jefferson Education. The video learning company has previously raised $1.57 million. This investment will go towards marketing, including a name change to Practice XYZ. Cuemath has raised $4 million from Sequoia India and Unitus Seed Fund for its math tutoring centers. Citelighter has raised $2.1 million in a convertible note from New York Angels, Baltimore Angels, and Harvard Business School Angels. The startup has raised $6.55 million total. Video game company Triseum has raised $1.43 million from an undisclosed set of investors. Code Kingdoms has raised $1.4 million from Initial Capital, SparkLabs Global, Charles Mindenhall, and Manoj Badale. The startup, which offers Minecraft tutorials, has raised $1.8 million total. Tutoring startup Preply has raised $1.3 million in seed funding from Arthur Kosten, RTAventures, and Mariusz Gralewski. Fishtree has received an undisclosed amount of investment from Jefferson Education. Up ’til now, the “personalized lesson” company has raised $3 million. FoxConn will acquire SMART for $4.50 a share, according to a press release from the smartboard maker. PowerSchool has acquired the LMS Haiku Learning for an undisclosed sum. Levine Leichtman Capital Partners has acquired testing company GL Education for an undisclosed sum. “Amplify Slims Down and Spins Off Assessment Content Provider, Fluence,” says Edsurge. “How does philanthropy drive the research agenda in higher ed?” asks Education Dive. “Apple, Microsoft, Amazon and Google Are Fighting a War for the Classroom,” says Edutechnica, with a look at how many colleges have adopted their competing pseudo-LMSes. The latest claims about “mindsets”: the mindset of a college president; the maker mindset. “Foreign Students Seen Cheating More Than Domestic Ones,” according to The Wall Street Journal. “Seen” cheating. Via CB Insights: “Ed Tech 101: Investors And Corporate Execs Sound Off On Ed Tech Disruption.” Depressingly terrible soundbites. “Adaptive Learning Earns an Incomplete,” says Michael Feldstein in a Chronicle of Higher Education op-ed about recent SRI Education research on the technology that shows adaptive learning software doesn’t really make much of a difference on students’ grades. You wouldn’t guess that there are any questions about the efficacy of adaptive learning based on headlines based on recent research about Dreambox Learning: “Customized math lessons could help students learn more, research says,” according to The Hechinger Report. “Harvard Finds That DreamBox Learning Improves Math Test Scores,” according to Edsurge. A new research report from the Shanker Institute looks at whether or not public schools are inefficient. According to marketing research by the International Data Corporation, “Tablets will see a decline, then increase in 2018.” I can’t seem to find out how much the IDC will charge you to see the data behind this claim. But hey. The business of selling ed-tech data seems to also be a thriving market. RIP educational psychologist Jerome Bruner, who passed away this week at age 100. Remembrances from Education Week, The Atlantic, and Brain Pickings.